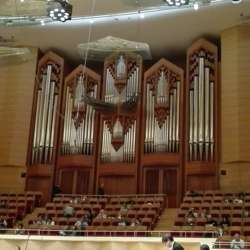 An acoustic quality of the hall has been praised as a “jewelry box of sound” by the legendary conductor Herbert von Karajan, and all of world known classical music players have performed on the stage. This time, Yokohama based non-professional orchestra named Minato Mirai 21 Orchestra will play Gustav Mahler and Leos Janacek – Moravia in Czech originated composers. Concert Admission : JPY 1,500. The Sinfonietta (subtitled “Military Sinfonietta” or “Sokol Festival”) is a very expressive and festive, late work for large orchestra (of which 25 are brass players) by the Czech composer Leoš Janáček. It is dedicated “To the Czechoslovak Army” and Janáček said it was intended to express “contemporary free man, his spiritual beauty and joy, his strength, courage and determination to fight for victory.” It started by Janáček listening to a brass band, becoming inspired to write some fanfares of his own. When the organisers of the Sokol Gymnastic Festival approached him for a commission, he developed the material into the Sinfonietta. He later dropped the word military. The first performance was in Prague on 26 June Protected content Václav Talich. Kindly only sign up, if you are sure you can make it. If finally something comes up with you, please make sure to sign off 1 week in advance, so other members can join the activity!